Salmon, turnips, escarole. No I’m not listing rejected ingredients in my barren fridge, I’m referring to the three star ingredients in Cerulean’s Wild Sitka Salmon. After a long night of cooking, I convinced sous chef Esteban Rosas to have a beer and walk me through the dish. What ensued was a culinary lesson ripe with tips you can take home. First we tackled the fish. To get a perfect sear, you need a couple of things: a “rockin’ hot” pan and a dry filet. Why dry? Because moisture in or on the fish will evaporate in the pan and ruin your sear. Esteban waits until the oil in his pan has just started smoking before laying the fish down away from himself to avoid splatter. After the filet is in the pan, he takes the heat to low and lets it cook (without touching it) until it’s 90% done. At this point Esteban flips the fish, kills the flame, and allows the carry-over heat to finish the job. As the fish is cooking Esteban is simultaneously heating up carrot puree while sautéing the escarole and turnips. Escarole, in season as you read, is a milder member of the endive family. As soon as it’s wilted the pan is deglazed with white wine and lemon juice to finish it off. The dish is plated to emphasize negative space (look for a more comprehensive plating and styling post soon) and finished with pickled mustard seeds and a soy orange glaze. The Sitka Wild Salmon is one of Esteban’s favorite dishes because of its multicultural influences. 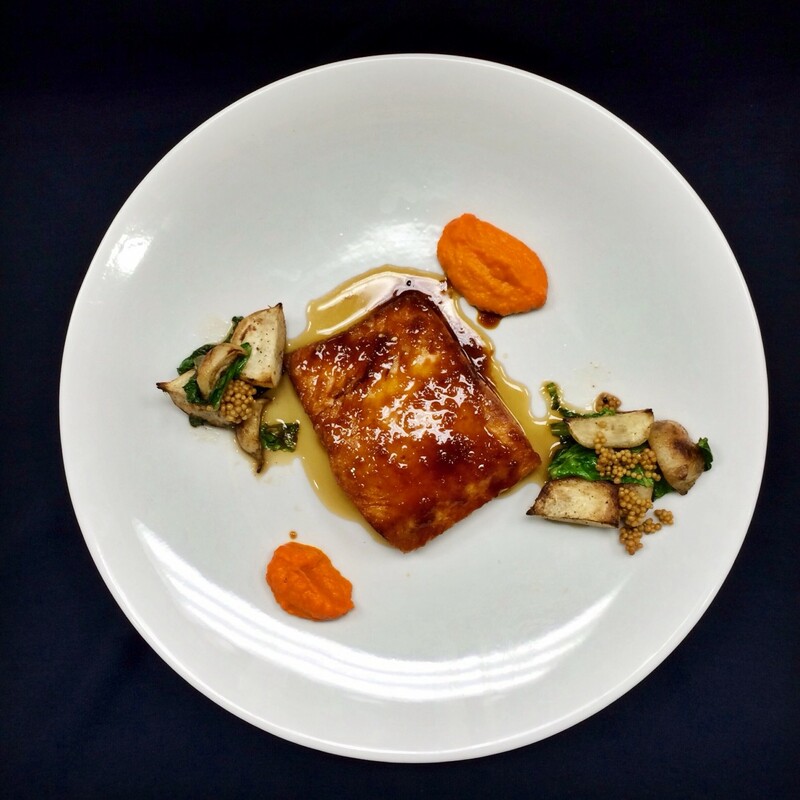 The savory/sweet glaze is reminiscent of Japanese teriyaki, while the escarole, mustard seeds, and turnips are classically French. As you can see by the photo, I obviously hated the whole thing.